Copper rilascia una nuova versione di DS 1942, emulatore del gioco arcade 1942. YOU MUST PATCH THE NDS FILE WITH THE DLDI PATCH BEFORE USING IT. You must patch the nds file with the drivers compatible with your linker. Recent linkers like the Cyclo DS evolution patch nds file automatically. Use 7zip to decompress 1942.nds from the DS1942.7z archive in a directory of your card. Put the MAME's ROM files at the root or in the /MAMERoms subdirectory on your flashcard. Un emulatore MAME per Nintendo DS? Ma sapevo che giochi del mame richiedevano molta potenza. 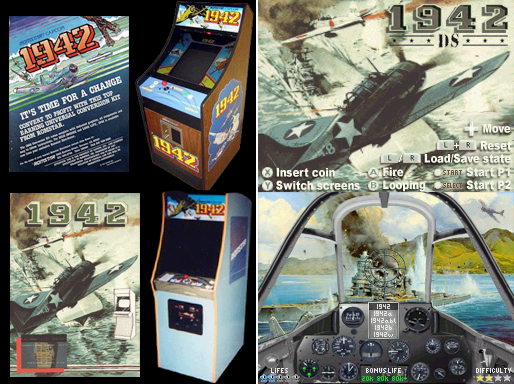 Difatti supporta solo il gioco 1942.